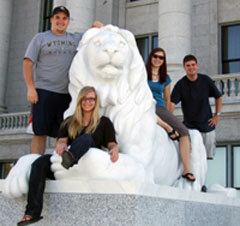 These are among the University of Wyoming students who took second at the regional Geobowl competition. In front is Savannah Neufer of Thornton, Colo., and in back, from left, are Brandon Combs of Valparaiso, Ind., Stephanie Bartlett of Laramie and David Corcoran of McCall, Idaho. The University of Wyoming World Geography Team took second place at this year's Association of American Geographers (AAG) regional competition at Utah State University. UW's team members were Stephanie Bartlett of Laramie, Brandon Combs of Valparaiso, Ind., David Corcoran of McCall, Idaho, Kyle Dobbins of Evanston, Daniel Ervin of Los Angeles, Calif., Savannah Neufer of Thornton, Colo., and Richard Vercoe of Orangevale, Calif. The competition consisted of several rounds of questions covering a broad range of topics, including political, physical or historical geography, cartography, weather and climate. The GeoBowl is patterned after the old television show "College Bowl." Each team sits at a table with electronic buzzers that members can each activate if they think they know the answer to a toss-up question. Additional questions are asked, and team members can confer and answer as a team. UW defeated collegiate teams from a region that includes Colorado, Montana, Nebraska, North Dakota, South Dakota, Kansas and Utah to place at the AAG's Rocky Mountain/Great Plains Division competition. Kansas State University took first place.